Now that I have finished Box 1. and got the shifting mechanism and drive train working properly, I thought I might start my own thread about this project. 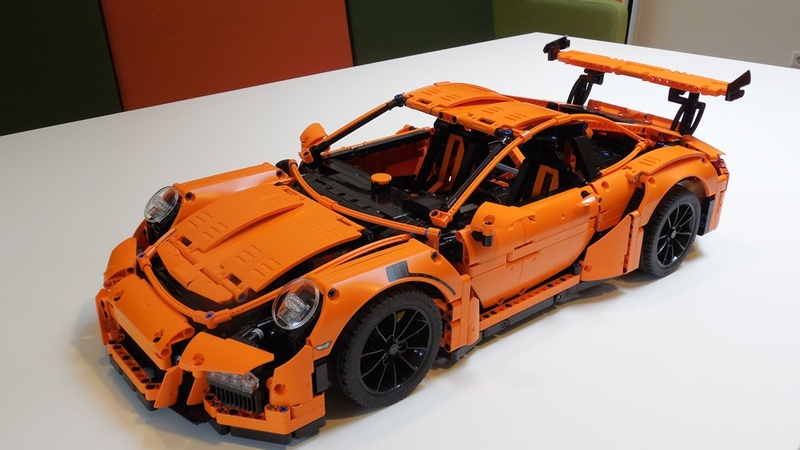 I plan to submit the result to the Porsche of Your Dreams contest. With this project I aim for playability rather than authenticity. So McPherson strut suspension and rear wheel steering? Probably not. But HoG steering and HoG shifting? Yes. I'm actually working on 2 versions, the minimal version and the ultimate version. The minimal version includes all 'must-have' modifications - or fixes - that I listed in the minimal sections below. The ultimate version will include rear HoG steering, rear HoG shifting, a more sturdy chassis, a dashboard gear indicator, Ackermann steering and a stabilized gear rack. The ultimate version also includes all essential fixes, but sometimes implemented in a different way to fit the more advanced modifications. I will keep an index here on the OP of this thread of all the modifications I implemented or plan to implement. I do not plan for full-blown instructions. For now I can only offer this thread with reports on all MODs and a LXF-file showing the differences in terms of groups: In each group there is a subgroup representing the old structure and the new structure. 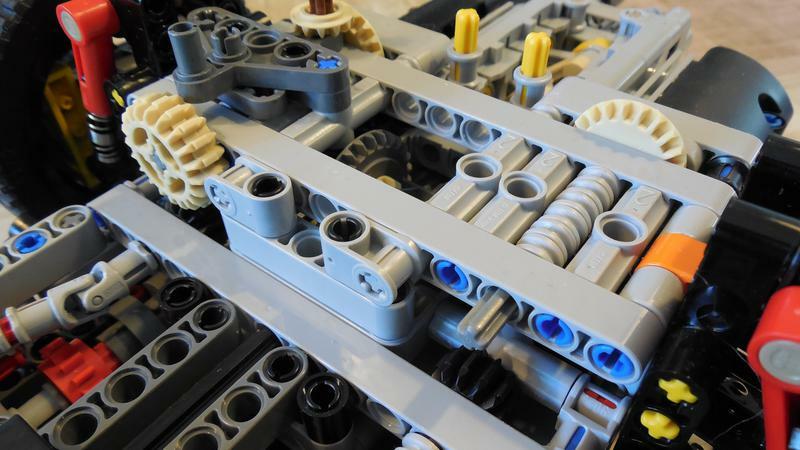 Both new structures and old structures are embedded in a version of the chassis. By clicking on a group or subgroup in the group tab you select all parts in that group. Now when you invert the selection and then delete the selection you see a cutaway of the group, which allows you to inspect the group thoroughly. Use Ctrl-Z to undo the delete after inspection. This way you can inspect the differences group by group. I also have a parts list available with the extra parts needed for this version. 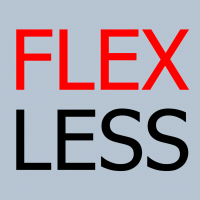 You need to make sure each individual axle that is part of the shift or drive train runs smoothly, with the least of friction. Make sure gears don't rub against liftarms, especially the red clutch gears need some play. 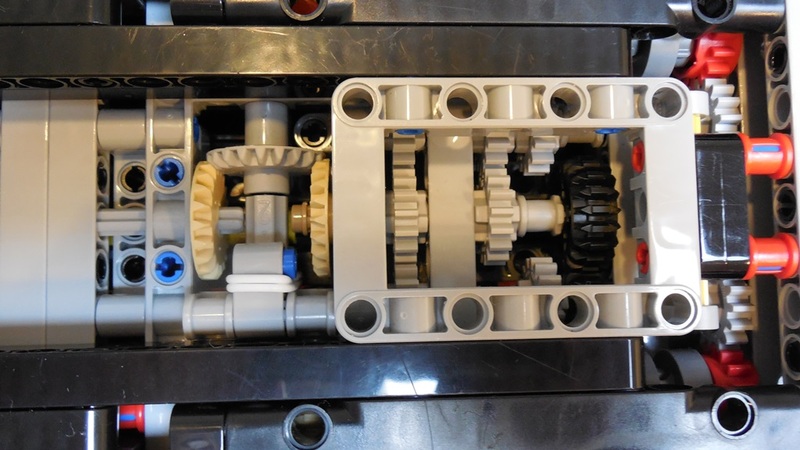 When you replace the knob gears inside the PDK-unit with bevel gears, make sure the axles keep their original orientation. A knob gear mesh implies a 45 degree orientation difference. 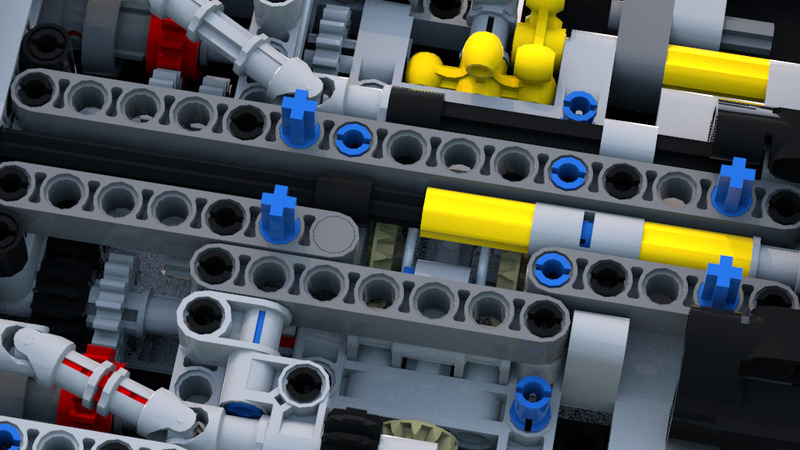 Note that the 3L pins with 1L axle inside the PDK-unit need to be inserted half a stud deeper than what the LXF-file shows. LDD does not allow a full insertion. 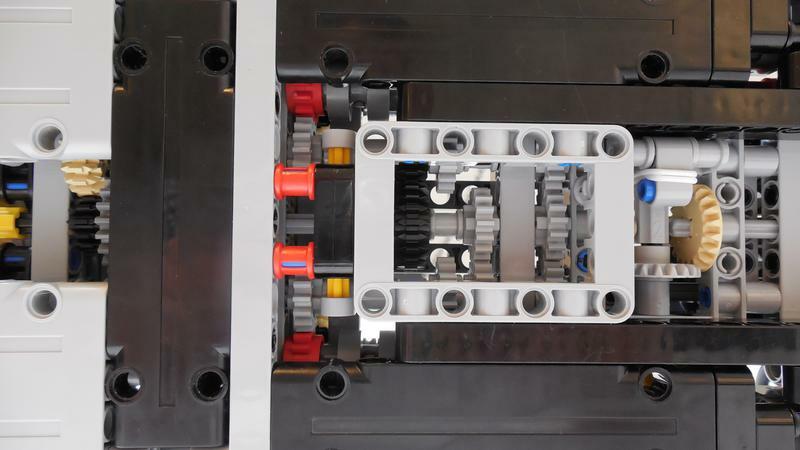 Also check the changes to Box 2; for instance the way the vertically placed black panel in front of the rear suspension module has been secured to adequately lock up the 20t bevel gears used for the rear HoGs. Also check the changes to Box 3 and 4, which are needed to make the body removable. I applied Paul Boratko's gear sequence fix as described in Jim's review. I flipped the change-over-catches in paddle-shifter-unit by 180 degrees (as suggested by Attika). I added the simple 90° limiter to the gear selector axle; used two of the four white silicon bands. 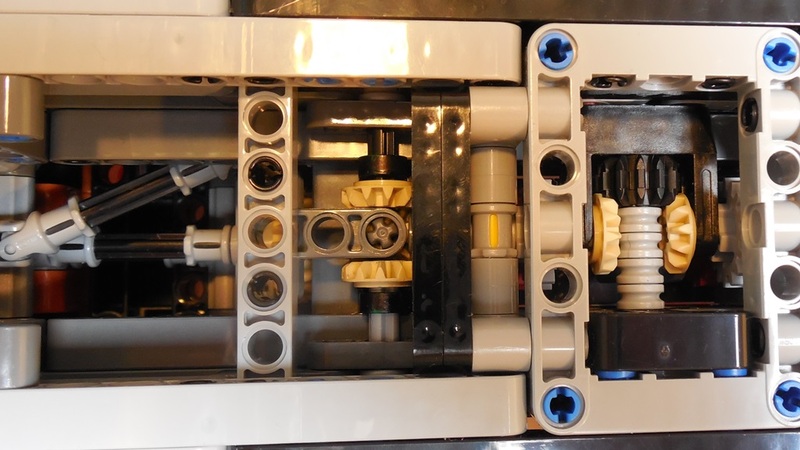 I removed the 8 tooth gears used to add friction; minimized friction in the selector axle instead. I used only one silicon band for each paddle shifter; wrapped it around the neck of the ball joint once. 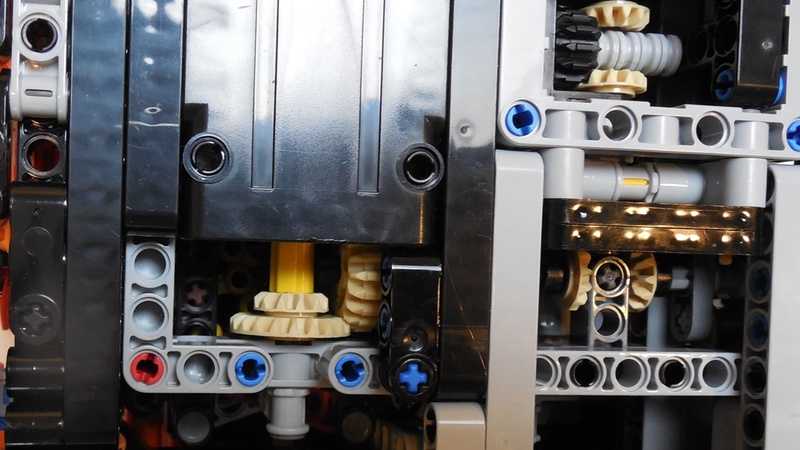 I extended both change-over-catches in the gearbox with half a stud (more info here). I removed the pin-joiner in the D+N+R-gearbox. 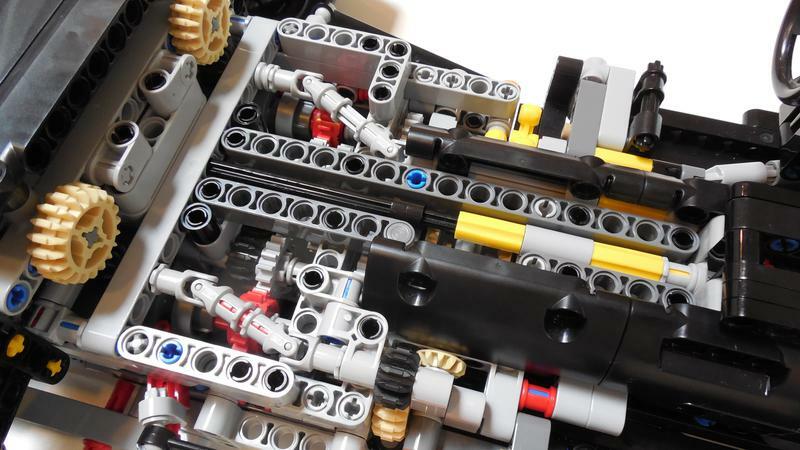 Original idea suggested by Blakbird, see his detailed build report. I avoided red gears from transferring torque on axles rotating at different speed, see eliminate friction in gearbox. 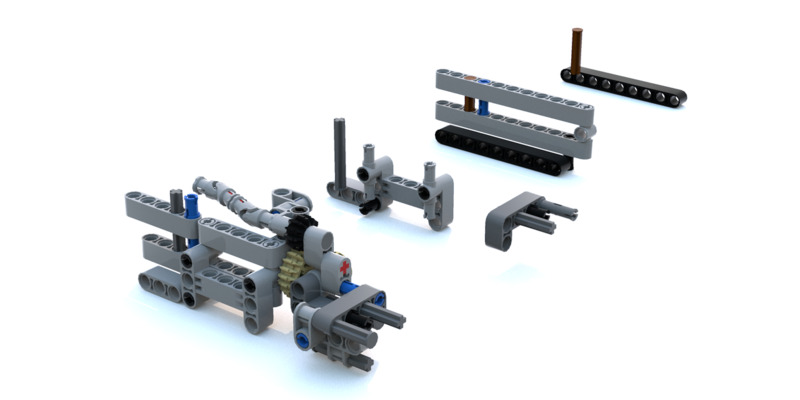 I added an extra support for the 15L axle running from D+N+R gearbox to differential, see alternative axle scheme. 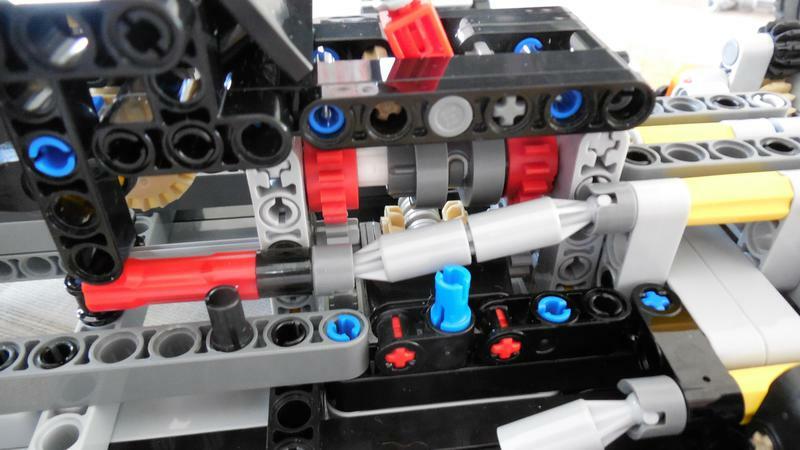 I avoided axle connectors from rubbing against lift-arms as suggested by nerdsforprez, see alternative axle scheme. I replaced the white clutch gear with a gearless friction clutch, see alternative axle scheme and white gear replacement. Now I could gear up the engine: Replaced the 2 16t gears with a pair of 24t-8t gears, see eliminate friction in gearbox. For the minimal version I made building instructions in terms of errata. The errata will help you implement the necessary fixes while building the model from scratch. It provides a list of extra parts you need (only 30 small and commonly used parts) and a sequence of steps that serve as a replacement of the corresponding steps in the original building instructions. All can be found in this PDF. and on Rebrickable. The errata include a 4th-to-1st gear block, but do not provide instructions for additional features like HoG steering or a removable body. I was a little bit in doubt whether to include all changes to the axle scheme or not. Blakbird - who has test-driven this set of modifications, thanks for that! 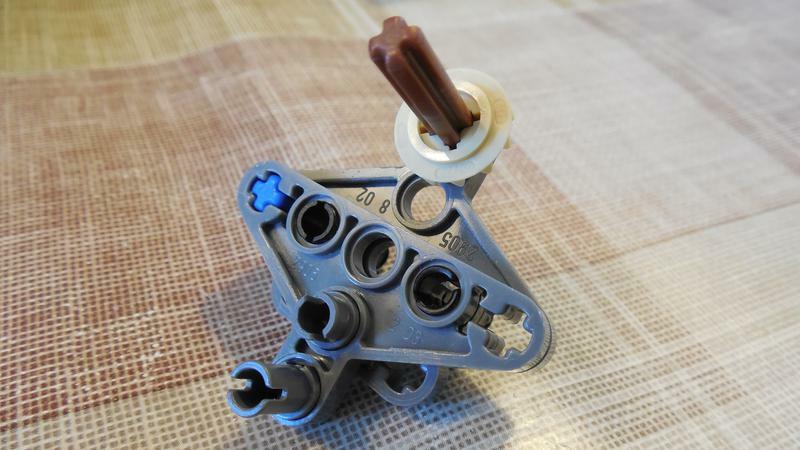 - was already satisfied without applying all changes to avoid connectors from rubbing against liftarms. I decided to include them anhyway, beacuse I think it's simply a matter of good practice and since these errata are specifically useful when you build the model from scratch, it's an easy gain. For all MODs that are included in the errata I also made a LDD-file of Box 1. showing the differences in terms of groups: In each group there is a subgroup containing the old structure and a subgroup containing the new structure. 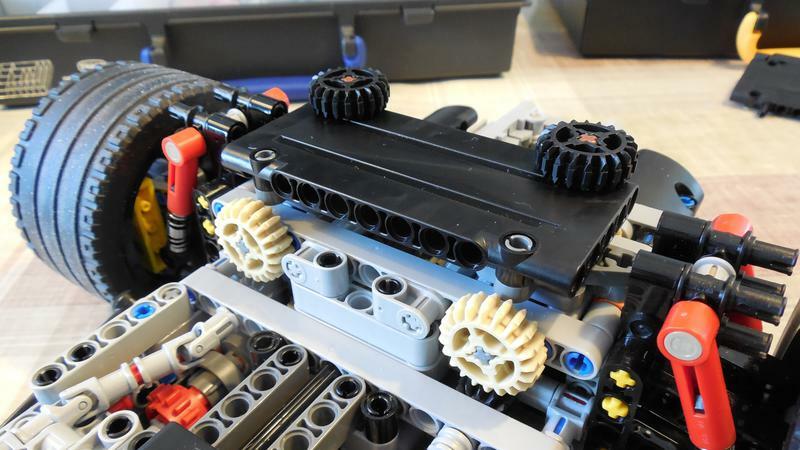 All new structures are embedded in the complete chassis and all old structures are placed to the side of the chassis. By clicking on a subgroup you select all parts in that group. That way you can inspect the differences. 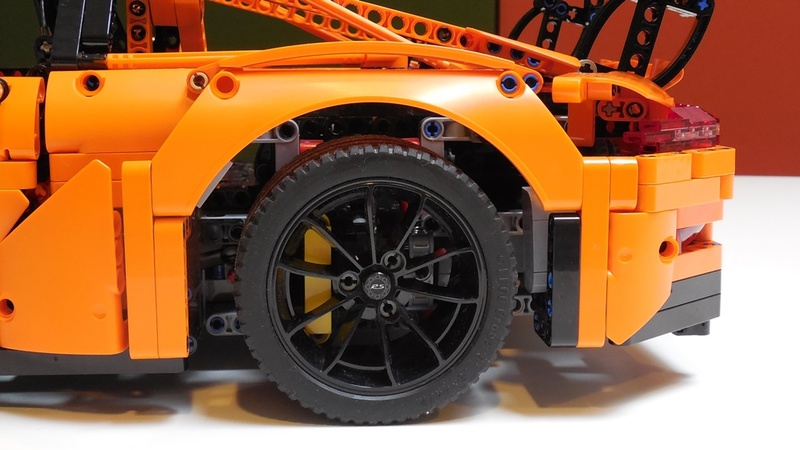 Besides the modifications listed above the LDD-file contains HoG steering. Lockable doors is in the other topic (page 11 or 12) or did you want to make your own version? For your second rear HOG, I'd suggest HOG steering. To improve playability if you want to switch gears while going into a corner I think it's easier if both are in the rear instead of using 2 hands or moving one hand from the front steering HOG to the rear gearswitch HOG. Or place your gearswitch HOG on the dash as well? After the initial reviews the Porsche became a PASS to me, but all the mods published to date have slowly changed my stance on the set. Now I will get it for sure, (second hand or on sale), the HoG shifting.on the video was too cool to resist. Now all we need is for someone to make clear instructions for all the great mods available! I love that you have collected all of this in one place. My only concern with your mods is that you are still on Box 1 so we don't know to what extent these mods might interfere with the body later and/or require additional modification. I am awaiting your findings on this matter. I assume you will also end up making the body removable when you get to that point. I have made that mod myself but must admit that it is still quite a procedure to get the body off. Thank you Blakbird. I understand your concern, but I checked that of course. 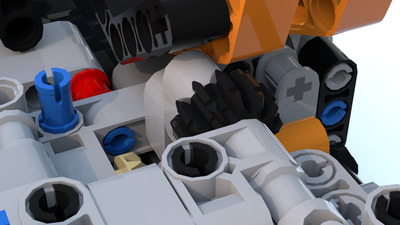 My goal is to make the MODs fit the body as is, so I built the closest parts of Box 2 in LDD to verify. It comes close to the seats but will turn out fine I think. I added some screenshots. But it could still be that I get to deal with something unforeseen when building the body. I indeed plan to make the body removable too. You are doing a great job...! After I got my set on day 1, and built it, I started looking around for mods to make it great. When I came across this site and joined it, it was great to see so many experts coming together to make an ultimate modded product. I am very grateful for what you're doing Didumos. 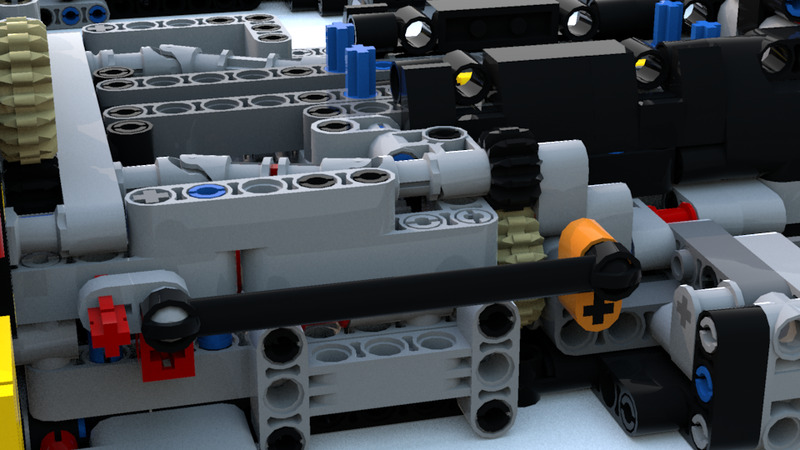 I look forward to this ultimate mod -- in my very first technic set, out of my dark ages. Today I plan to wire the second HoG underneath the rear window from the back to the front and at the same time I want to place some lengthwise liftarms on top of the gearbox. That should make the chassis a little stiffer and avoid the gears from being squeezed when playing with the chassis only. I want this build to be playable without body too . I wanted to add two 15L liftarms, but unfortunately the 90 degree limiter won't let me. I have to divide one of them into a 5L and a 7L liftarm. To add the liftarms I will first insert two 5x3 frames between the D+N+R-console and the gearbox. These frames will also serve to carry the HoG axle to the front. To place the frames I will have to take the whole front section apart. However, the most important issue to tackle is the 24t gear that is in the center of the gearbox. It will collide with the liftarms I have in mind. 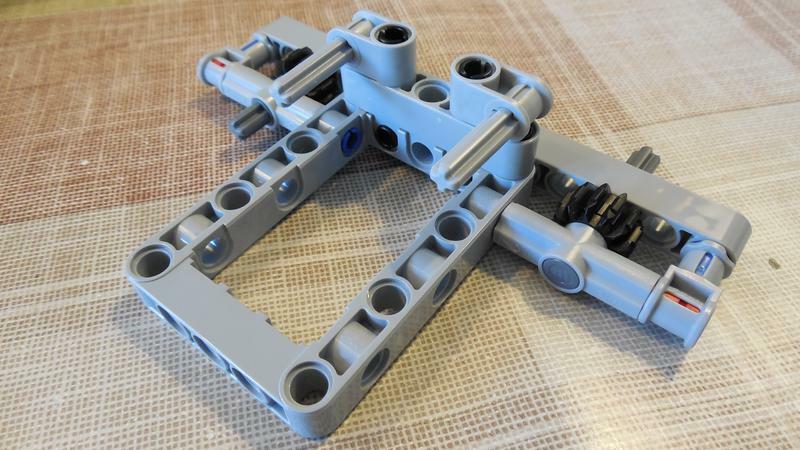 Btw, the blue 2L axle-pin connectors sticking out of the liftarms will insert into a black panel when the body is added. So what I will do first is rearrange the gears in the gearbox: I will swap 1st and 3rd gear and I will swap 2nd and 4th gear. 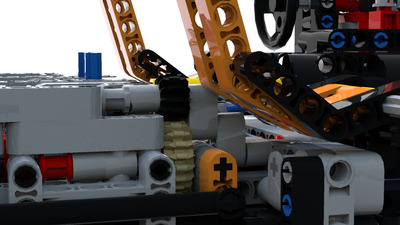 If I'm not mistaken this won't effect the gear sequence, as long as I also rotate the orange paddles by 180 degrees. Or actually this isn't even necessary when I swap both 1st with 3rd and 2nd with 4th, but then I would have to change my 1st to 4th gear block . I checked with LDD and the only parts that will collide with the 24t gear is the dummy red 3L pin with axle hole that was only needed to avoid mistakes with placing the diff. Time to remove it . All this should fit the out-of-the-box body. I managed to do what I planned to do. I routed the second HoG in the back to the front and I made the chassis somewhat sturdier by building a little more structure inside the mid-console. 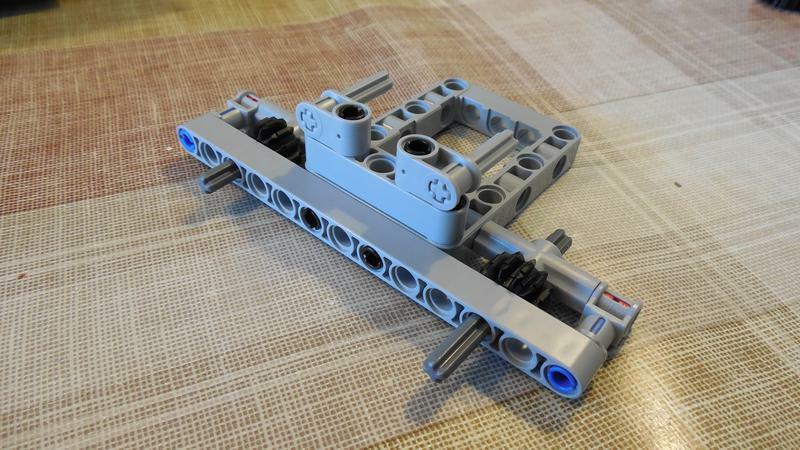 Part of this structure are a few lengthwise liftarms that run over the gearbox. I had to swap 1st and 3rd gear and 2nd and 4th gear to make room for the liftarms. All worked out fine. The whole mid section of the chassis is very rigid now. 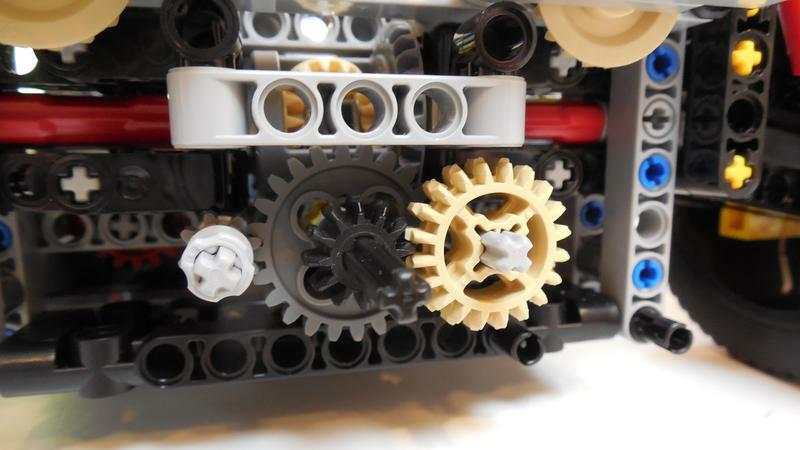 Also the gear sequence and gear ratios have not changed, even though they switched positions. 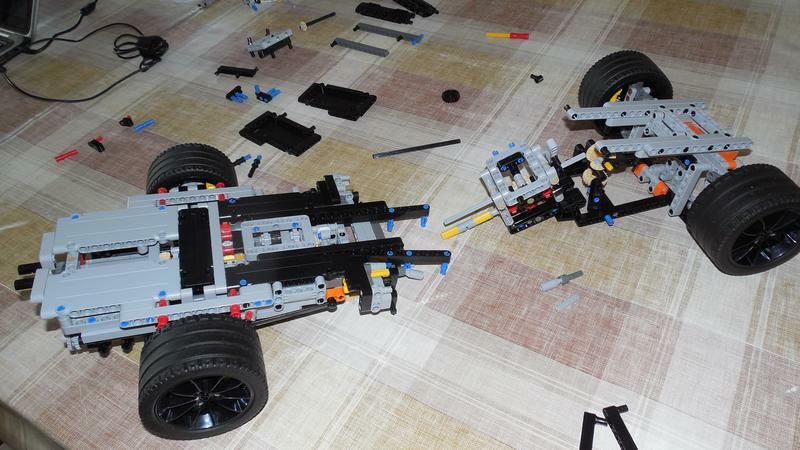 The most difficult part has been to get all axles and clutch gears to run smoothly again. That took me at least 2 hours. This remains to be the problem with this gearbox. I hope I don't need to take appart the whole chassis again . 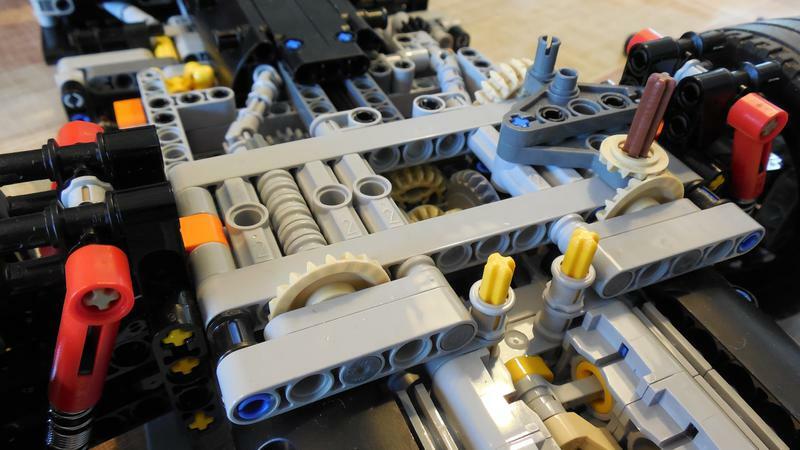 As a side note: I think the time consuming finetuning is an issue with most Lego gearboxes, or at least the ones I have seen. 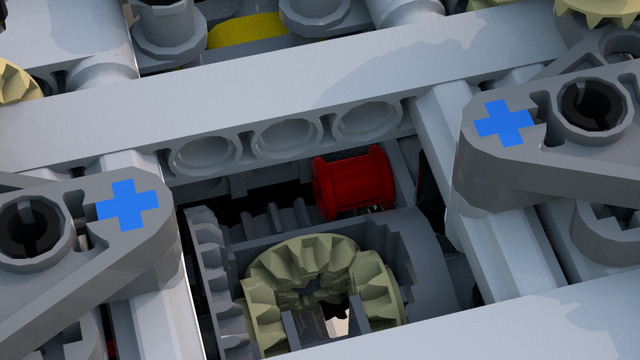 IMO there is something inherently wrong with the Lego clutch gears and driving rings: They need to be enclosed by liftarms or another stop, otherwise the driving ring will simply push the red clutch gear out of place and it won't get engaged. At the same time they need some play, otherwise they won't rotate freely when not engaged. These two condition are hard to unify, especially when you take into account that a red clutch gear measures exactly one stud. But the result is there. The gears run more smooth as ever and the chassis is substantially sturdier . Here are some pics of the work in progress. I will upload two short videos later, as my wifi won't let me right now. Taking the chassis apart, so far no good . I also moved the DGB 4x2 liftarm that serves as 4th to 1st gear block to this side of the 11x5 frame. This way it can also support a pin with pin hole that is used for routing the second HoG.. This is terrific! I wish I had even just a fraction of your talent. Really looking forward to getting my grubby mitts on this set so I can tinker around with it and implement your mods. I'd rather speak of urge, but thanks! Besides the must-haves that I listed in the OP of this thread it contains HoG steering and a 4th to 1st gear block. I deliberately left out the reverse gear shifting block because it takes up a lot of space and still allows to shift from 4th gear to neutral and back. Does this version of the LXF file not include the rear HOG steering + gear shift? Or is that just coming as you tweak more things? Didumos, I have been following the mods on YouTube. The rubber band 90 degree limiter as well as the blocker preventing 4th-to-1st switching make so much sense that I'm surprised they weren't part of the official design. 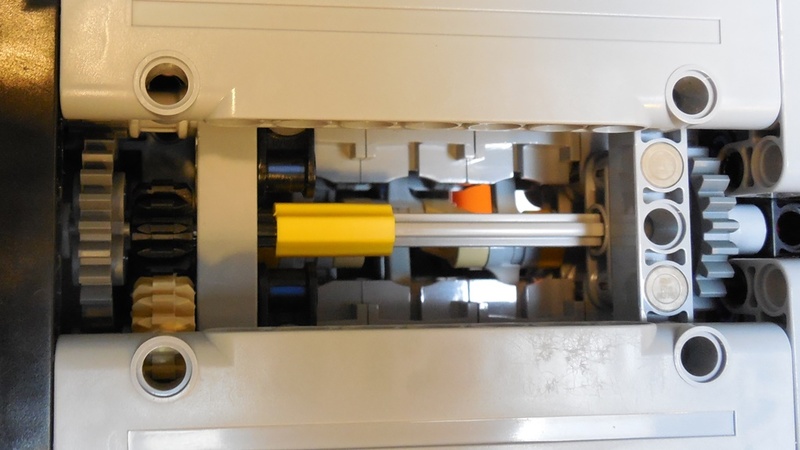 I built the modified version of the gearbox and it even works with the 3L ribbed sliders that are used on the 2nd generation of clutch rings - although I can see the advantage of using the new smooth sliders. If you have some time you can consolidate all your modification videos into one, or maybe make a playlist because the changes you apply make the operation of the gearbox really easy to understand. Really good work, keep it up. Yes, these are not included. I'm actually working on 2 versions, the essential MODs version and the advanced MODs version. The essentials version includes all 'must-have' modifications - or fixes - that I listed in the Essentials sections in the OP. The LXF-file that I made available represents that version. I don't think much will change in that one so I thought it was time to share. The advanced version will include rear HoG steering, rear HoG shifting, a more sturdy chassis and a dashboard gear indicator, but I'm still working on that one. Rear HoG steering, rear HoG shifting and the dashboard gear indicator all work well, but I'm still not satisfied about the operation of the paddle-shifter-unit. But I will probably write a dedicated post about the rear HoGs in the near future. Thank you very much! Good idea to make something like a playlist to bundle all important video's. I'm quite new to youtube. And when I'm completely satisfied about my build I will certainly make a compilation video. Today I would like to show how I realized the rear HoGs. It has become a kind of photo report. EDIT (2016/07/01): I changed the position of the rear HoGs which also resulted in a slightly different routing of the rear HoG steering. See this post. 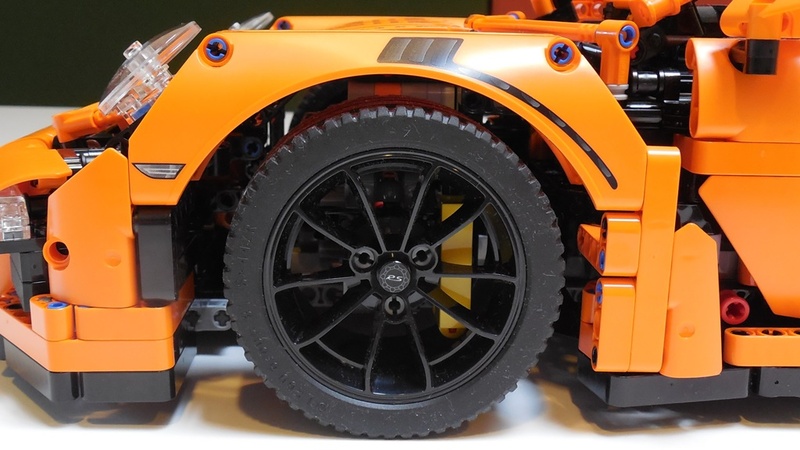 There is one stud space above and in front of the rear suspension module. I made use of this space and I used the holes in the panels of the body for the HoGs. It wasn't easy and I had to pull some tricks to get all gears slip-proof. This is the structure that I built around the front-side of the 5x7 frame holding the diff. The wide structure holds the output axles of the HoGs. To make sure gears won't slip, each axle - I used a 5.5L axle with stop for HoG steering and a 4L axle with end-stop for HoG shifting - is supported on each side of the gear. The structure on top of the frame is used to glue the frame to the 13L liftarms running above the diff. Without this glue these liftarms get easily pushed away (upwards) from the frame, which will cause slipping gears. Next step is to put a set of angle elements #2 into place and two 8L axles with end-stop, each with a 20t bevel gear. The axles are firmly secured with 6 half bushes each to avoid the bevel gears from slipping. 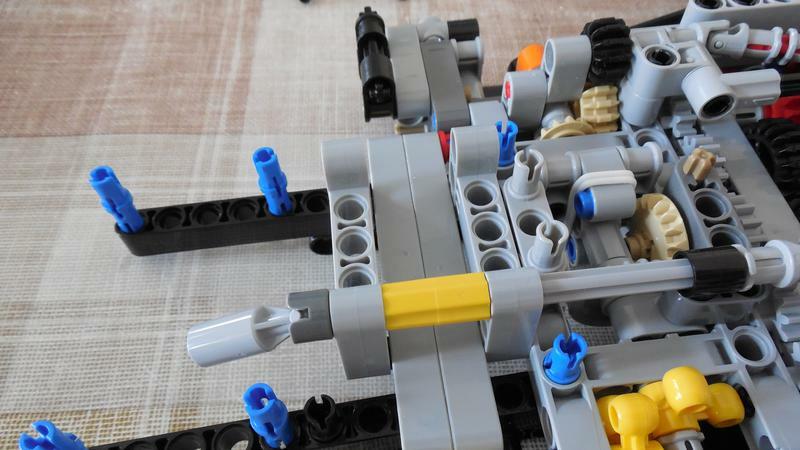 The axles should still rotate without friction. At the back side 2 5L liftarms and 2 4L levers are used to lock-up the bevel gears. The HoG setup is finsihed with two of these structures. I used two 3L axles with end-stop that where originally used for the change-over-catches in the gearbox. I replaced those with 4L axles with end-stop. 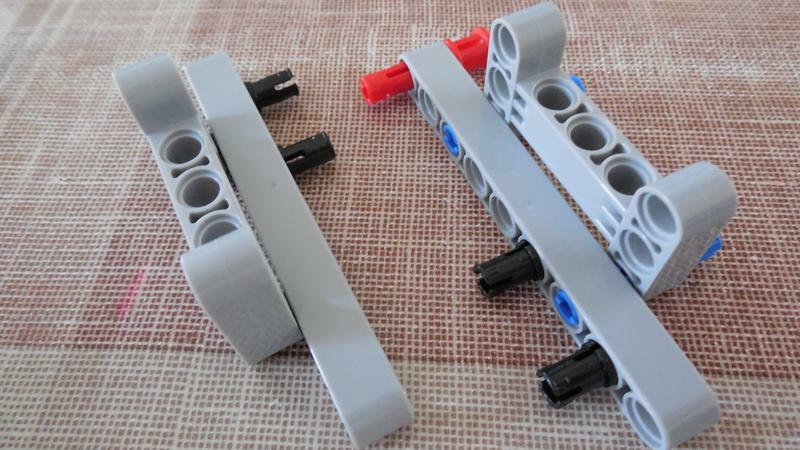 Though it is not really compatible with your "engine new mount mod" (not sure of its purpose either yet), but wouldn't this be easier to hold the 2 13L liftarms together above the diff instead of using alot of parts to "glue" it together? That would indeed be a good way to keep the 13L liftarms together. However, it won't help to avoid gears from getting displaced. Actually, this was not what I meant with glue. I was referring to the parts stacked on top of the front side of the 5x7 frame. These parts are to avoid the front 13L liftarm above the diff from bending upwards, away from the 5x7 frame around the diff. This caused the gears at the front to slip. I couldn't find a better way to fix the 13L liftarm to the 5x7 frame, there's no room on the inside of the frame, but this is good enough to avoid the liftarm from bending. I could use your method for the 20t bevel gear at the back though, but then it would have to tie the front 13L liftarm to an additional liftarm behind the 20t bevel gears. That would collide with the engine. The 6 #2 elements I used between the 13L liftarms are not used to glue the liftarms together, but to get a firm hold on the 3x5 levers that hold the vertical HoG axle. It's important to secure that axle otherwise the 12t bevel gear attached to it will slip. I hope this better explains what I mean. Btw, from an engineering point of view, the Porsche chassis has a very bad structure. It doesn't have coherence. It's probably a matter of personal opinion, but now that I have rigidified the rest of the chassis, the engine part was wagging like a dog's tail . When you look closely at the last image before I add the 3L pin with axle hole, you can see there is a gap between the 13L liftarm and the 3L pin with pin hole. I didn't take the time yet to explain about the HoG shifting. 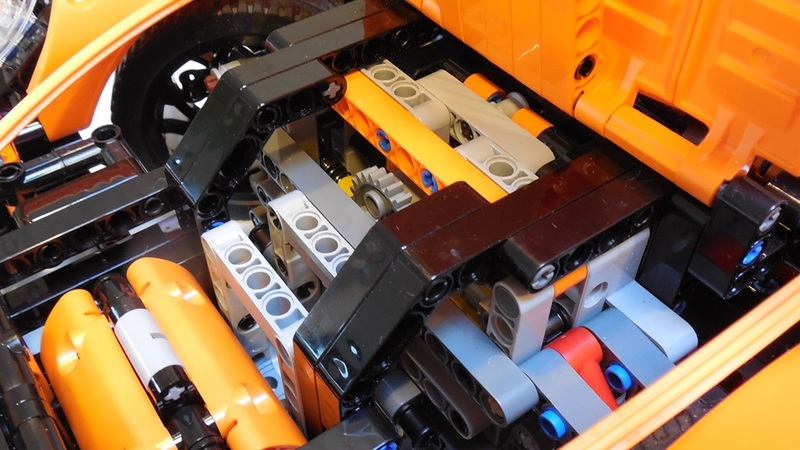 After replacing the 8t friction gears with a 90 degree indexer, the gear selecter axle (with the orange paddles) operates fairly leightweight. That improvement paved the road for a HoG driving the gear selecter axle. Also the paddle-shifter-unit can deal with the gear selecter being operated from outside the unit. Furthermore it's important to know that this MOD is built on top of the Sturdy without body MOD. I also assume you already know about the rear HoGs themselves, but how does one of them function as gear selecter? HoG shifting operates via the right side of the H-frame with the 90 degree limiter in it. The first part is easy, I simply attached two U-joints to the HoG output axle. The second U-joint is attached to a 4L axle with end-stop, which is supported by a few perpendicular connectors. This axle carries a 12t bevel gear. Next step is to place a 20t gear against the back side of the H-frame. To do that, I had to drop the 2 11L liftarms running along the right side of the gearbox. 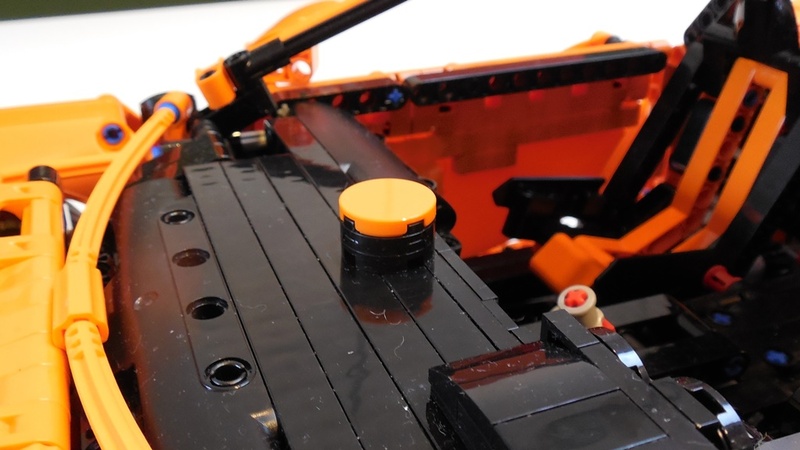 I also had to drop the 3L pin with pin hole supporting the gear selecter axle (with the orange flaps). To compensate for this dropped support, I added a 4x2 liftarm that arrives at the gear selecter axle from the front side. 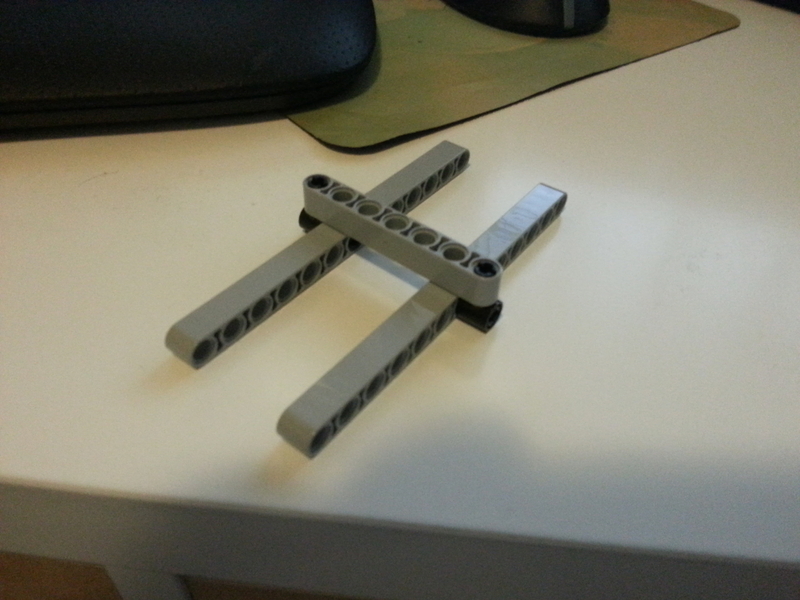 I added some other parts to firmly integrate this 4x2 liftarm. Now the 20t bevel gear can be placed against the back side of the H-frame. 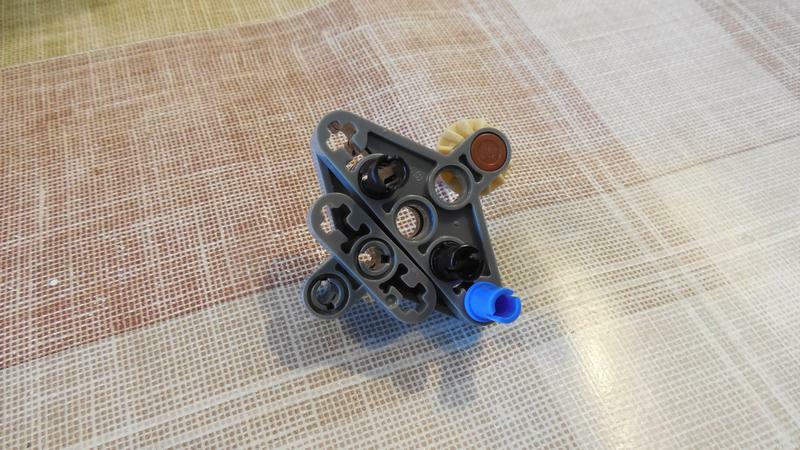 I had to attach it to a frictionless pin-axle connector, not ideal, but there is simply no space for an axle longer than 2 studs. The 20t bevel gear drives the selecter axle via a 12t thin bevel gear. Finaly, to avoid slipping gears, I secured the outer end of the axle inserted into the second U-joint using 2 2L (+0)-liftarms. The lower 2L (+0)-liftarm is attached to the H-frame. This way the gears won't slip for sure. 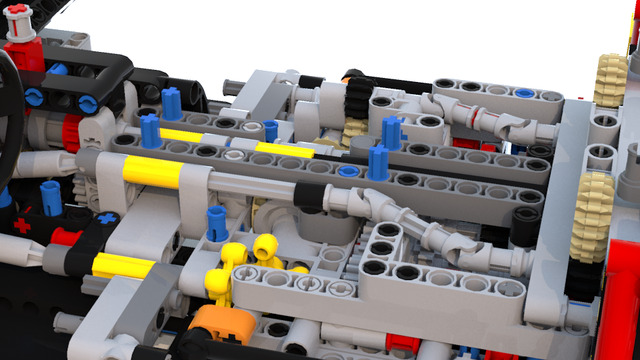 All my 'advanced' MODs fit Box 2., in LDD that is. Checked it many times already, but I'm even more confident now.